The United Defense M42 sub-machine gun has a moderately complicated history, a history rather more convoluted than its original creators, High Standard, had intended. The M42 was originally created as a replacement for the Thompson sub-machine gun. The gun was designed by Carl Swebilius, working for High Standard and so, as it was being designed to compete with the Thompson, original design work would most likely have been based on the weapon being chambered for the US standard pistol cartridge, the .45ACP. That being said High Standard were also interested in being able to sell the M42 to foreign governments as well, so the design was made so it could be chambered either for the .45ACP or the European 9mm Parabellum. The magazine for the 9mm Parabellum chambering was designed by John E. Owsley and held 25 rounds, while the .45ACP version held 20 rounds. Only six prototypes in .45ACP were ever made. The M42 was made to be a quality replacement for the Thompson. Like the Thompson the M42 required much machining as it did not used stamped parts except for its magazines. The weapon tipped the scales at 10 lb (4.54 kg) empty, so it was very similar in weight to the Tommy Gun. Barrel length was 11″ giving an overall weapon length of 32.3″ (82 cm). The barrel featured six grooves, right hand twist. The fire controls are located on the right side of the action providing “Semi-Auto”, “Safe”, and “Auto” modes. The M42 was designed to be simple and reliable. 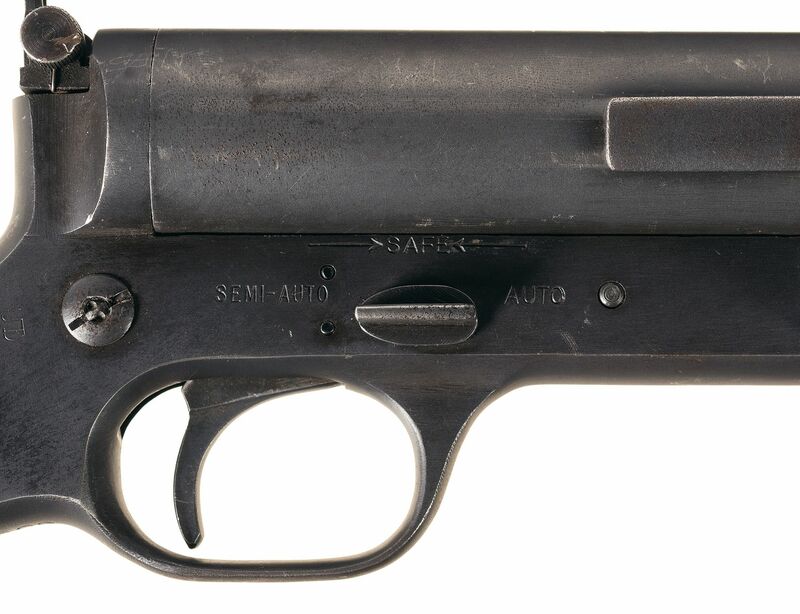 Despite requiring machining Carl Swebilius had ensured his design both matched the quality of the Thompson but made manufacture easier. The weapon used a straight blow-back design and was easier to field strip than either the Thompson or the British Sten Mark II. A strong point of the M42 was its superior accuracy out to 100 yards when compared to the Thompson. Its weak points were a tendency to be sensitive to mud and sand, requiring it to be kept clean, and a tendency for the pressed steel magazines to warp in the heat of combat causing malfunctions. The sights were a windage adjustable peep sight at the rear and a ramp mounted blade at the front. High Standard commissioned a gentleman named Frank Jonas to seek out interested government potential buyers and the Dutch government expressed initial interest. As it turned out while Carl Swebilius was working on the design of the M42, High Standard were given an order from the British Ministry of Defense for manufacture of 12,000 Browning .50 caliber machine guns within a ten month period. High Standard did not have such a huge manufacturing facility that it could continue with both projects and so they opted to build the tried and proven .50 Browning machine guns rather than gamble on the new and unproven M42 project. With that project on hold Messrs. Pope and Jackson of the British Purchasing Commission expressed an interest in the M42 and signed an agreement with High Standard allowing them to manufacture the M42 and requiring the payment of a royalty fee to High Standard for each one made. Messrs Pope and Jackson decided to set up a company of their own and called it the United Defense Corporation. It would appear that High Standard were not particularly happy about this new arrangement and they refused to supply Pope and Jackson with the blueprints for the M42. Undeterred Pope and Jackson were able to secure two orders, each for 7,500 “United Defense” M42 sub-machine guns, so 15,000 in total, and they approached Marlin to make the weapons. With High Standard unwilling to provide the blueprints Marlin were faced with a daunting task of pretty much creating their own and figuring out tolerances etc. They nonetheless successfully manufactured the guns. The next stumbling block however was the Nazi German invasion of Holland in May 1940 which left 15,000 homeless M42’s sitting in a warehouse and not being shipped to a country under German occupation. The United Defense M42 sub-machine gun in 9mm Parabellum. The 9mm magazines held 25 rounds and were commonly welded together for quick reloading. Cyclic rate was 700rpm so a 25 round magazine emptied rather quickly. When you are in the middle of fighting a war it doesn’t make a lot of sense to have 15,000 sub-machine guns sitting idle in a warehouse and so the US Government acquired them with a view to using them as needs arose. These guns came under the control of the Office of Strategic Services (the forerunner of the CIA), and the US Navy, for irregular operations and to supply to resistance fighters and partisans. Quantities were dropped in France, which proved to be a not so good idea as the Nazis picked a lot of them up and no doubt looked up into the sky smiling as they said “danke”. The OSS found the M42 to be an excellent little tool however and the sub-machine gun was well liked by their clandestine operators. They found their way to many combat areas in places such as China, the Philippines, Crete and France. Some even found their way to Holland where they were placed in the hands of the Dutch Resistance and were no doubt used effectively. The United Defense M42 in our pictures is being offered for sale by Rock Island Auction on September 8th, 2018. You will find the sale page for this item if you click here. This M42 is expected to sell in the range USD$20,000-$30,000. These are a relatively scarce gun to find, especially in such good condition. We hope its new owner has the opportunity to try it out. The gun comes with one “double magazine” (a pair of magazines welded together as illustrated) and five United Defense marked blued steel single magazines, and a modern case. So it looks like it comes with everything needed for a day at the range except for a suitable quantity of 9mm Parabellum ammunition.